In English, this and that (and these and those) have an associated proximity: this/these tend to be things nearer than that/those. However, in French, on their own, ce/cet/cette can mean either this or that, and ces can mean either these or those - it just depends on context. Cet arbre est très sinistre. That tree is very sinister. -> This is to make pronunciation easier! Note that it doesn't apply to feminine nouns starting with a vowel or mute h, as cette doesn't pose any pronunciation issue! Ces citrouilles sont tellement grandes ! These pumpkins are so big! Cette aventure était amusante ! 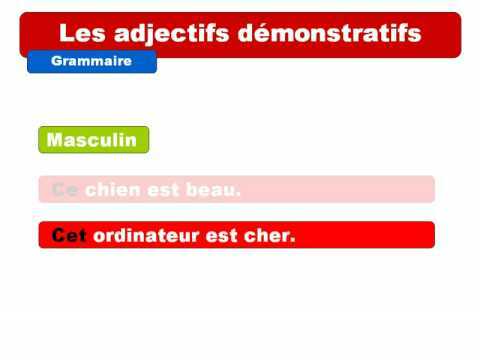 Ce/cet/cette/ces are demonstrative pronouns, as the lesson explains. Your question is in regard to ses, which is a posessive pronoun. Can you clarify what exactly you are aksing? Can "these" ever be translated as "ce" as opposed to "ces" in French? What is the proper way to translate: "These are good family times" in French? Google Translate and Duolingo have it as "ce sont de bons moments en famille" but isn't "these" supposed to be "ces"? Confused! Please help! You use ces when it relates to an easily identifiable noun. In the example you quote, "these" relates to a more vague and general time rather than a concrete noun. Ce sont de beaux temps. -- These are good times. Ces vacances étaient merveilleuses. -- This vacation was marvelous. Thank you. Would you be able to tell me if "these" is a demonstrative pronoun or demonstrative adjective? And also, would you be able to elaborate or point me towards a more technical explanation on why "these" can be translated as "ce" in certain cases? If followed by a noun, "ce/cette/ces" is a demonstartive adjective and agrees in number and gender with the noun. If followed by a verb (often times "est" or "sont") it is always "ce". Why we say in French, “cette école “. Why it is not “cet école”? Because you école start with a vowel. The noun école is feminine (une école). That's why it requires the feminine version of the demonstrative pronoun: cette école. Frustrating - not able to progress due to too long a period between being able to take further quizes. How can I work towards a Silver Star on a specific area when the Kwizbot will not allow me to take any further quizzes for what looks like more than 8 days since the last quiz taken ? It looks like when I take a few quizzes I am then hamstrung against making further progress for far too long a period of time. Hi Pauline - instead of using the microkwiz on the lesson pages, either kwiz against your dashboard recocommendations list (assuming it contains this lesson), or use the "add to notebook" buttons to save the lessons you want to practise and then kwiz against your notebook(s). There are no limits on normal kwizzes, only lesson microkwizzes (they weren't meant to be used for serious practice, and KwizBot doesn't intelligently pick questions for them so we have to limit people retaking them and seeing the same few questions instead of the fulls set available for the lesson - but since people seem to like using them in this way, we are looking at improving them soon). Kwizzing against notebooks or levels or your recommendations on your dashboard is the best way to use Kwiziq for now. Bute where would I find an overview on how to best use Lawless Progress ? So far, it seems to be trial and error and asking questions when frustrated. I'm not quite sure what your problem is. All the information you need is available on the website. If you've taken the full assessment, you'll be informed of your level and can work to imptove on that level, or any other level, with the recommended lessons followed by kwizzes. Just "Choose your own adventure". When I subscribed, I started with the full assessment "Test Your French Against the CFER Standard". When I read the results I saw that I had many gaps at all the levels. I began by learning the lessons needed to fill the gaps in my knowledge starting with level A1. I regularly did the kwizzes at that level until I was assessed at 75%, after which I started on the gaps at Level A2 and repeated the process. I continued systematically with this method, moving up the levels, whilst returning from time to time to the earlier levels to improve my scores. It worked. Trial and error won't ever work. If you have not subscribed as a premium user and are limited to ten kwizzes a month, it is essential to be systematically moving up the levels, otherwise you create gaps in your knowledge. Also, I would avoid the micro kwizzes because some of them have a few as three questions and they are counted in your total of kwizzes taken. ce -- the pronoun to use with male nouns starting with a consonant. cet --for male nouns starting with a vowel. cette -- for female nouns. L'aventure is a female noun, so you need to use cette. Hi Chris, you say "ce -- the pronoun ..."
Should 'ce' be a 'demonstrative adjective' (and not a pronoun) as discussed in this lesson? Yes, I guess the correct term is demonstrative adjective. -- Chris. Question already answered correctly by Chris . There are no special feminine forms to be used before a word starting with a vowel. They exist for the masculine version simply for the sole reason to make the whole conglomerate easier to pronounce (to French tongues) because of the two vowels which would otherwise follow each other. The feminine versions are pronounced ending in a consonant, hence there's no need for a special version. Cet oiseau (the intervening t provides a nice transition). Cette amie (the "e" at the end is not pronounced, therefore there is no vowel clash). Thank you for this interesting question. Why isn't "cet" used with singular feminin nouns that begin with a vowel or mute "h"? Bonjour Marilyn, Good question! Cette is the feminine demonstrative adjective, no matter what the noun begins with. The adjective "cet" is used for reasons of euphony in front of masculine nouns that begin with a vowel or mute h, simply because it's too difficult to say the hiatus in, for example, "ce homme" or "ce étudiant." Ce becomes cet to make these phrases easier to pronounce: cet homme, cet étudiant. Feminine nouns don't have this problem: cette + vowel / mute h doesn't have that difficult-to-pronounce hiatus, so there's no reason to change the spelling to cet (which is pronounced identically): cette étudiante. Why are there different tenses? Past tense in English but present tense in French. Bonjour William, If I am understanding your question correctly, the answer will have to do with syntax structure difference. There are several instances where French syntax is nothing like English syntax. A French teacher that I had loved to tell the class that «French is not simply English translated into French». By that she meant that one cannot simply translate an English sentence into French on a word-for-word basis, phrasing is different as is adjective placement and a couple of other differences. J'espère que cela vous aiderait.